This Saturday being the first of the month, we welcome back our only regular duo, Sankarshan Kini and Holger Jetter. 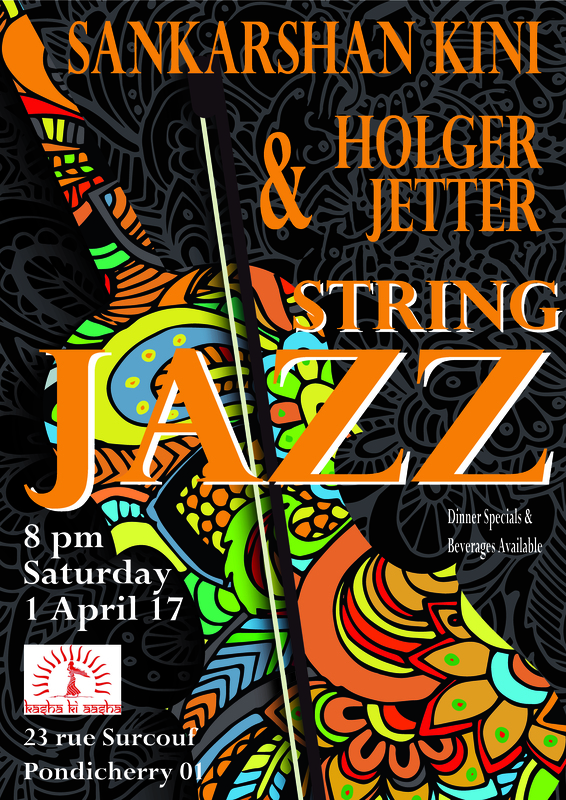 Their unique sound of violin, bass and guitar with Shanks at the microphone is always worth hearing and they continue to surprise us with new play lists of jazz classic tunes every month! Join us at 8 pm for a great musical performance, some of those South Indian favorites from Kasha Ki Aasha’s kitchen and be a part of another purely Pondicherry moment on our terrace. Kasha Ki Aasha is at 23 rue Surcouf Street, Pondy 01. You don’t need reservations, we will always make room for another jazz lover!